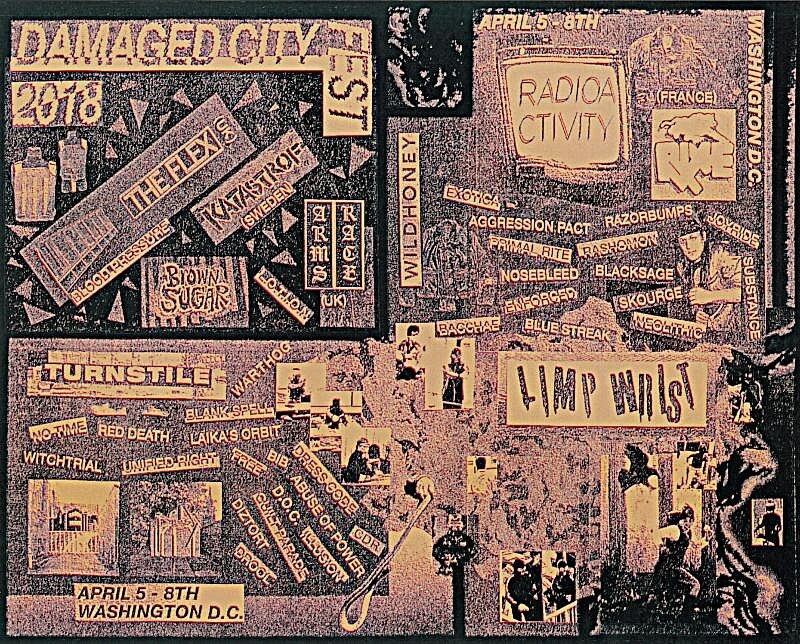 Annual DC punk festival Damaged City Fest returns April 5-8 with a pre-show, late shows, an art show, and of course the main event taking place across The Black Cat, All Souls Unitarian Church, and Hole in the Sky. Turnstile headline the pre-show on April 5 at All Souls Unitarian Church and that doubles as a release party for their killer new album TIME & SPACE which just came out today. The pre-show also has Unified Right, Red Death, Razorbumps, Dress Code, and Bacchae, and admission for this show is just five bucks. The lineup also includes queercore vets Limp Wrist (playing their first DC show in 12 years) headlining the main Saturday show, and Marked Men offshoot Radioactivity headlining the main Friday show, plus The Flex, Warthog, Rixe, Wildhoney, Primal Rite, Free, and much more. See the full lineup and schedule below. Tickets for the fest and the pre-show are on sale now. A new Rixe promo tape also just came out, and you can stream that, along with one of the new Turnstile songs, below.